Having very recently written about Ocean Power technologies (OPT), I approached the ASX-listed Carnegie Clean Energy company with a slightly weary feeling of “Here we go again.” Just over a year ago at an AGM on 2 December 2016, Carnegie Wave Power (CWP) shareholders voted overwhelmingly to change the company name to Carnegie Clean Energy (CCE) in recognition of Carnegie’s broadening focus on clean energy. As CWP Carnegie, like OPT, specialised in developing unique proprietary technologies for wave power. Both companies received hefty aid, grants and government support in bringing their products on. 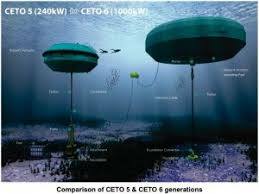 But the groups found wave energy has proved a hard sell globally. In UK, for example at least two prominent wave power companies have gone bust. OPT and CWP, as was, achieved significant technological progress, but more evident commercial success has proved elusive. 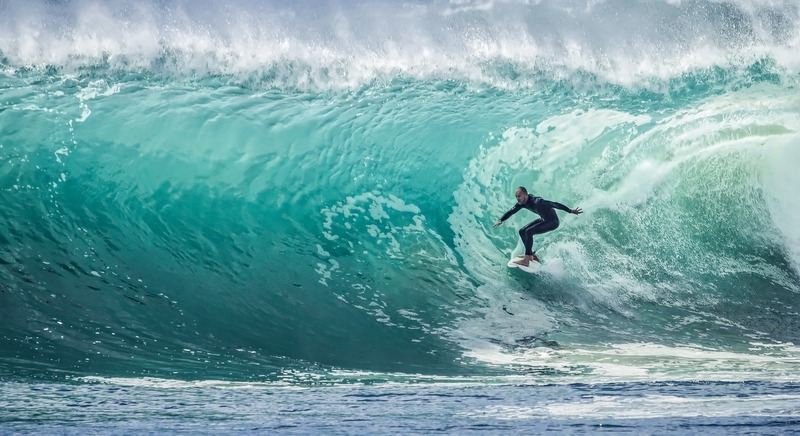 Wave power energy technology seems to be viewed somewhat differently in Australia, where more than 80 per cent of the population live on the coast. 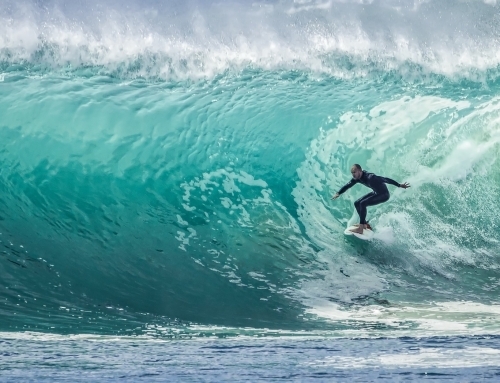 Wave power appears to have been given preference, when it comes to government support, over other older forms of alternative energy such as solar and wind power. 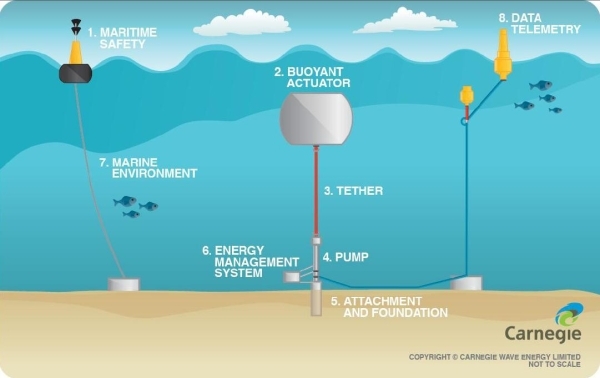 In this relatively benign environment, Carnegie has been developing its CETO wave energy technology for over 10 years, with the aid of government grants. Crucially,. Carnegie eventually successfully deployed and operated the world’s first grid connected array of three CETO 5 units at the Australian Navy base at Garden Island in Western Australia. Despite the name change CCE’s involvement in wave power continues. The challenge is to develop a follow-on from the pre-commercial project using the next generation of CETO technology, the much-improved CETO 6. To this end A$27million has been allocated to Carnegie’s Albany Wave Energy Project. Of this A$15.75m comes from the Western Australian government and the rest from the semi-government agency, the Australian Renewable Energy Agency (ARENA). The new CETO 6 unit will have a nominal capacity of 1.5MW up from 1MW for the previous design.The planned increase in capacity over the previous design should mean these units will be able to compete with other mainstream renewable technologies in cost terms. Carnegie will continue to use its Garden Island site for its own energy research and prototype testing. 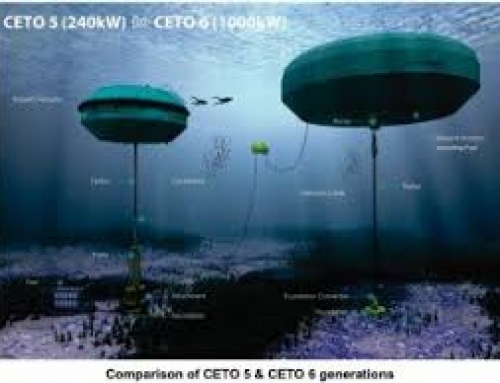 The Albany Wave Energy Project, however, will involve the design, manufacture and installation of CETO 6 units in Carnegie’s existing licence area offshore from Torbay and Sandpatch in Albany during the 2019/2020 summer weather window. Success of the initial project phase could be followed by a 20MW expansion which could in turn lead to a 100MW CETO wave farm at the site in Albany. This would certainly mean commercialisation, but not for a while yet. While still staying with wave power, CCE’s pledge to broaden its clean tech interests into other sectors has started to bear fruit. On 31 January 2018 the group released its Report to Shareholders for the First Two Quarters which ended on 31 December 2017. The report itemised progress being made in the diversification. Carnegie has started work on the new 10MW Northam Solar Farm. This will add to the company’s existing projects in Australia—Garden Island Microgrid in Western Australia, the CSIRO Square Kilometre Array and Delamere Weapons Range Microgrid in the Northern Territory. The Northam Solar Farm will be funded by a co-equity partnership with two investors, Indigenous Business Australia (IBA) and Perth Noongar Foundation (PNF). These two groups will hold 50 per cent of the equity with Carnegie retaining the other 50 per cent. The joint venture (JV) partners have also secured a A$7.5m debt facility for the scheme and this will be used for construction purposes, due to start this year. The other active new project is the Garden Island Microgrid which involves the construction and installation of a 2MW solar/PV array, a 2MW/0.5MWh battery energy storage system and a control system. Carnegie has received A$1.6m in grant funding from ARENA for the scheme. What does all this mean in terms of the financials? Well, like a lot of ASX companies Carnegie often does not give out profits and losses statements, as we would present them in the UK. In the December release of quarterly and half year figures the company issued a detailed summary of money in and out for the half year ending on December 31 2017. The consolidated statement of cash flows shows receipts from customers were A$2.9mfor the period and cash flows on operating activities which included everything from research and development, staff costs and advertising came to a deficit of (A$10,645). Against this, cash in the bank as of 31 December 2017 was A$5.9m so there is still some grant money in the kitty. But how long will it last at the company’s rate of cash burn. The share price quoted in A$ is currently bumping along at 3.8 cents some 52.50 per cent lower than a year ago. Hardly a sparkling performance. The market cap of A$104.25 suggests Carnegie is not an insubstantial company. But given the poor share price performance, the prospects that commercialisation is still some way off and the company’s funds could run out in six months given the current rate of burn suggests the shareholders must earnestly hope the Australian federal and state governments’ enthusiasm for supporting renewable energy does not wane.